Folding structure, low deck for easy push off, attractive design, kickstand. The Scooter Street Surfing Urban XPR Purple Pink is perfect for riding to work, in-town riding or trips with your children. 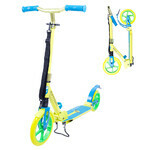 Its simple folding mechanism makes the scooter easy to carry. This is a fast and smooth scooter. The large, 205mm wheels will deal with moderate terrain. Hard bantam wheels are suitable for riding on uneven terrain. Inflatable rubber wheels are more suitable for adults. The front wheel is sometimes bigger than the rear one. These wheels are better for urban riding and longer more demanding trips. PVC wheels can be found on stunt and children's scooters. They are cheaper and suitable for parks or even terrain. For both recreational riding and riding through terrain, choose kick scooters with a steel or iron frame and aluminium components set. 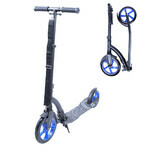 To make the scooter lighter, the frame can be also made of aluminium or plastic. Aluminium can be seen mainly in stunt or children's scooters. Foot brakes - suitable mainly for children's, stunt (freestyle) and urban kick scooters. The brake is engaged by stepping down on it, causing friction between it's mechanism and the wheel. V-brakes - suitable for higher weight limits (adults). Easy maintenance and affordable price. The brake is activated by a handlebar lever. Disc brakes - suitable mainly for sports enthusiasts. These brakes are more costly and harder to maintain. Hydraulic brakes - instead of a cable they are made of a piston with liquid in it. These brakes offer the highest quality and are the most expansive. The kick scooter's maximum weight limit. It is not recommended to exceed this limit. For the average weight of 80 kg, 100 kg weight limit is optimal, if you want to use the scooter for recreational purposes only. For heavy terrain and frequent use, you may want to choose a steel frame scooter with the weight limit in the range of 120 - 150 kg. Stunt scooters' weight limit ranges between 50 and 100 kg. When picking out a children's scooter, decide according to your child's weight but take into account their eventual growth. Wheel size significantly differs depending on the type of kick scooter. Wheels for children's kick scooters begin at 80 mm. Freestyle (stunt) kick scooters have wheels between 100 - 120 mm. Kick scooters for adults really vary in the size of their wheels. Ideal choice depends on your own preferences and experiences. Smaller wheels are easier to control. Larger wheels are more suitable for unever terrain. Adjustable handlebars are great for those who want to share their kick scooter with other rider of different height. They are also suitable for children, since the handlebars can be adjusted as your child grows. 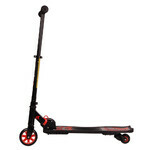 Most stunt (freestyle) scooters have one-piece handlebars to hold steady for tricks and jumps (their height cannot be adjusted). The recommended handlebar height for adults is generally 90 - 120 cm. Suitable handlebar height for children is usually 50 cm and higher (depends on the height of the child). The ideal handlebar should reach approximately up to the rider's hipbone. If the handlebars are too low, the rider may experience back pain. If the handlebars are too high, steering the kick scooter becomes difficult.